One thing is for sure: A clogged drain can really put a damper on your day! Whether you are standing in ankle-deep water while trying to enjoy your shower, you have a sluggish kitchen sink, or you are dealing with a backed-up toilet that is overflowing onto your bathroom floor, clogged drains are never fun. Unfortunately, clogged drains are pretty common. The next time you have a clogged drain, don’t reach for a bottle of dangerous chemical drain cleaner or risk making a huge mess with a plumbing snake. 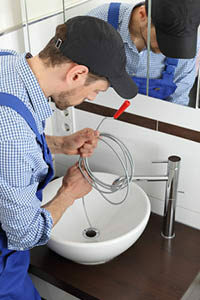 Save yourself a lot of time and frustration while keeping your family safe by contacting an expert plumber in Brighton NY at GT Campbell. We offer professional drain cleaning in Brighton, NY, and you can count on us to break up even the most stubborn clogs with ease. Foreign objects, including jewelry, toys, etc. In most cases, clogs start off minor and get worse with time. If you notice a drain that is no longer flowing as quickly as it used to, it’s a good idea to have it cleaned before a complete blockage can form. Doing so helps prevent the types of obstructions that can lead to serious messes. Partial clogs are also typically easier to remove. When you need drain cleaning in Brighton, NY, count on GT Campbell. We use the right equipment to eliminate even the most stubborn clogs without damaging your home or your pipes. When you contact us, we will schedule an appointment at a time that is convenient for you and get to work solving your problem as quickly as possible. If you need drain cleaning in Brighton, NY or the surrounding communities, please call now to schedule an appointment with one of our licensed, bonded, and insured technicians.